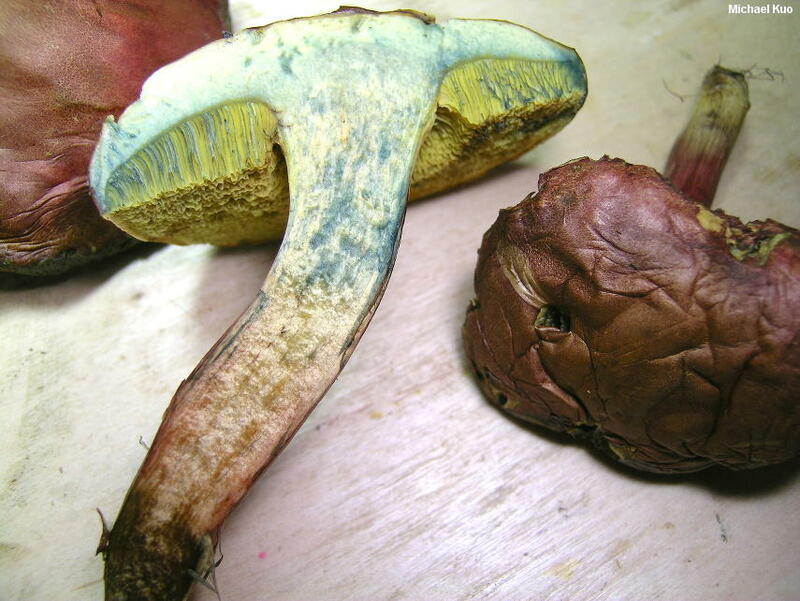 Boletus subfraternus is the "Malcolm in the Middle" of red-capped, blue-staining boletes; it is a little too large to get confused with Xerocomellus rubellus and similar species--and a little too small to get confused with Boletus bicolor and its associates. Distinguishing features, aside from size, include the pore surface, which develops widely separated slot-like lines near the stem, and which becomes a dark reddish brown in old age; the fact that the cap fades from dark red to brick red and, eventually, to brown; and microscopic features (see below). 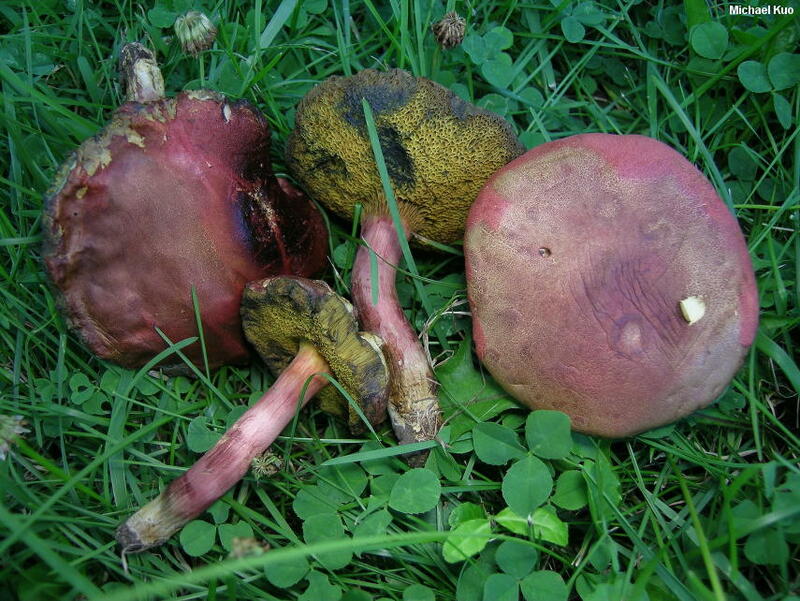 Using the generic concepts of Šutara (2008), Boletus subfraternus should probably be placed in Xerocomellus. 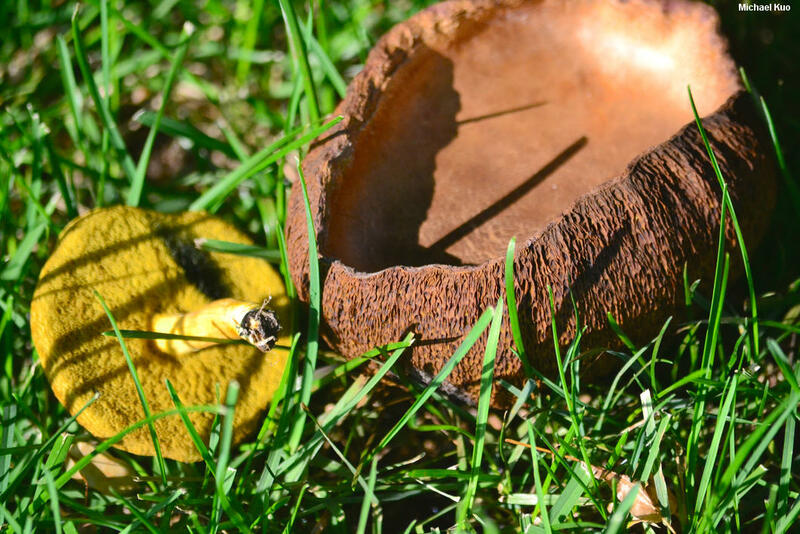 Ecology: Mycorrhizal with hardwoods, including oaks and Tilia species; growing alone, scattered, or gregariously, in woods or at their edges, in grassy areas in parks and gardens; summer; possibly widely distributed east of the Rocky Mountains. The illustrated and described collections are from Illinois. 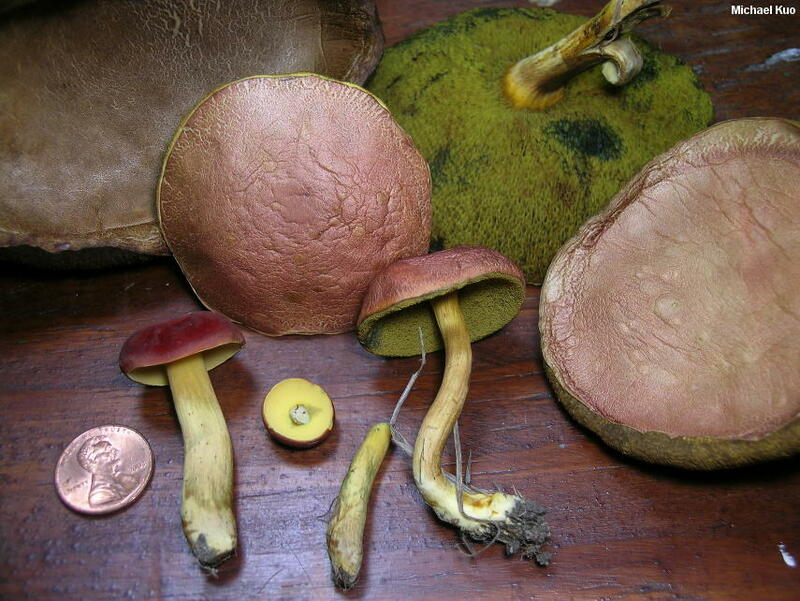 Cap: 4-9 cm; convex, becoming broadly convex or nearly flat in age; dry; finely velvety when very young, but soon bald; dark red at first, becoming brick red; fading to reddish, brown, or tan; the surface not usually becoming prominently cracked at maturity--but the pigments can sometimes become stretched out, creating the appearance of a cracked surface. Pore Surface: Often becoming depressed at the stem and, in age, developing slot-like or gill-like lines near the stem; bright yellow at first, becoming dingy golden yellow and, with old age, reddish brown; bruising promptly blue and then, over time, brown; with 1-2 angular pores per mm; tubes to about 1 cm deep. 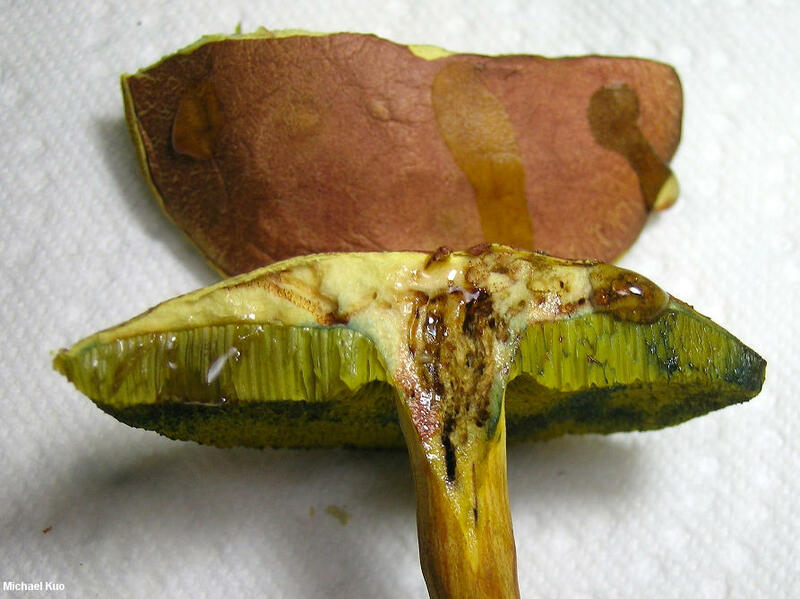 Stem: 4-9 cm long; 0.5-1.5 cm thick; more or less equal, or very slightly tapered to the base and/or flared at the apex; bright yellow at the apex; pinkish red overall, becoming brownish with age; yellowish basally; bald; dry; bruising blue when handled; not reticulate; basal mycelium bright yellow. 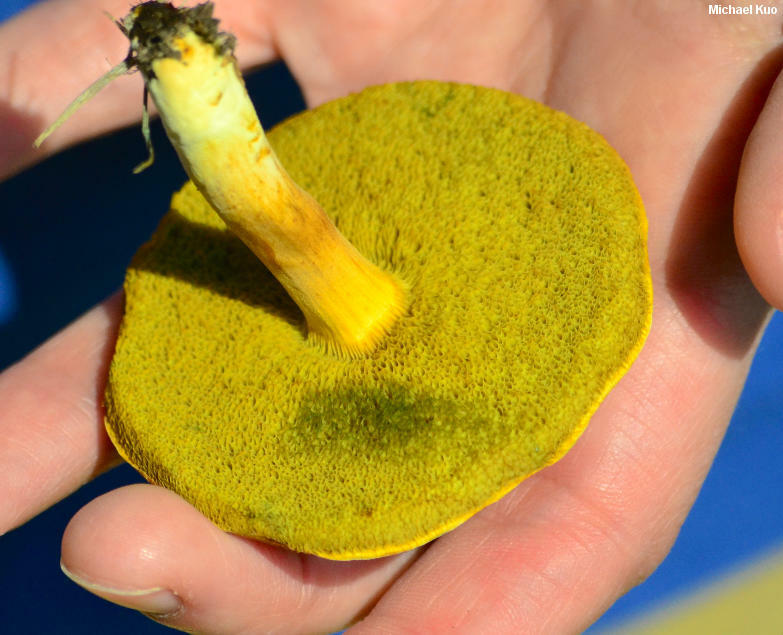 Flesh: Pale yellow; staining blue (sometimes faintly) when sliced; reddish to brownish in stem base. Chemical Reactions: Ammonia negative to yellowish on cap surface; negative (but erasing blue) on flesh. KOH dull orange on cap surface; dull orange on flesh. Iron salts negative to gray or bluish gray on cap surface; negative (but erasing blue) on flesh. 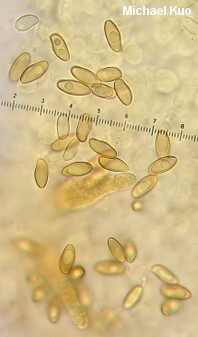 Microscopic Features: Spores 10-13 x 4-5 µ; subfusiform; smooth; yellow in KOH; brownish to reddish brown in Melzer's. 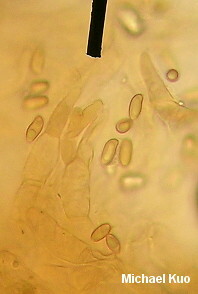 Hymenial cystidia lageniform; to about 40 x 12.5 µ; with granular orangish contents. Pileipellis a collapsing palisadoderm of elements 5-12.5 (-15) µ wide; terminal cells varying from obnapiform to subglobose, or tapered to subfusiform; yellow to orangish-brown in KOH; dark red in Melzer's. REFERENCES: Coker & Beers, 1943. (Smith & Thiers, 1971; Smith, Smith & Weber, 1981; Both, 1993; Bessette, Roody & Bessette, 2000.) Herb. Kuo 06191001, 08101302.